I’ve already posted my light bulb angel and my light bulb penguin, so here’s my light bulb snowman ornament to add to the group. I made this guy in 2000, 16 years and going strong! If you wrap them carefully, ornaments made from light bulbs will last a very long time. Keep in mind the age of this ornament when looking at this close up photo. He’s an old man now. The photo on the left (see below) was taken right after I made it and the photo on the right was taken in 2009 when I hung it on my tree. The photo at the top was taken today (2016) but I’ll take a better one this year when I put my tree up. 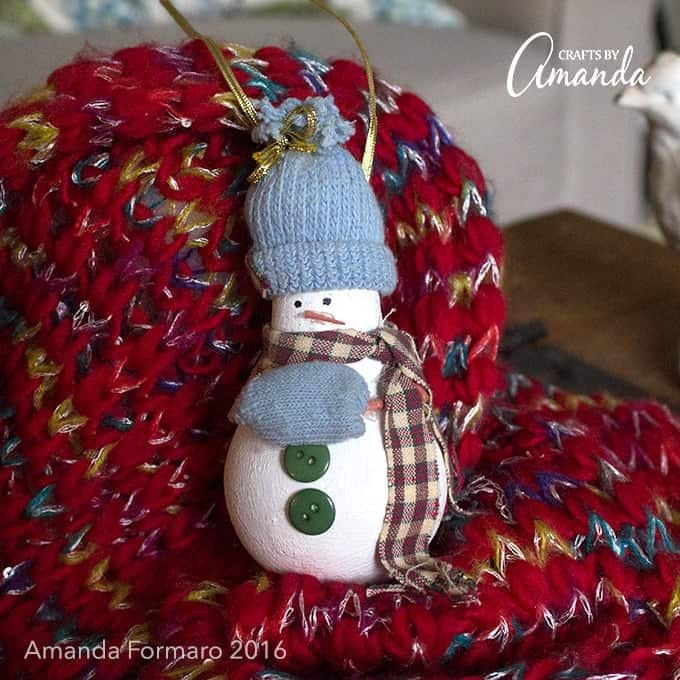 You can make a light bulb snowman too using my tutorial. I find crafting relaxing, so little bits and pieces make me happy. 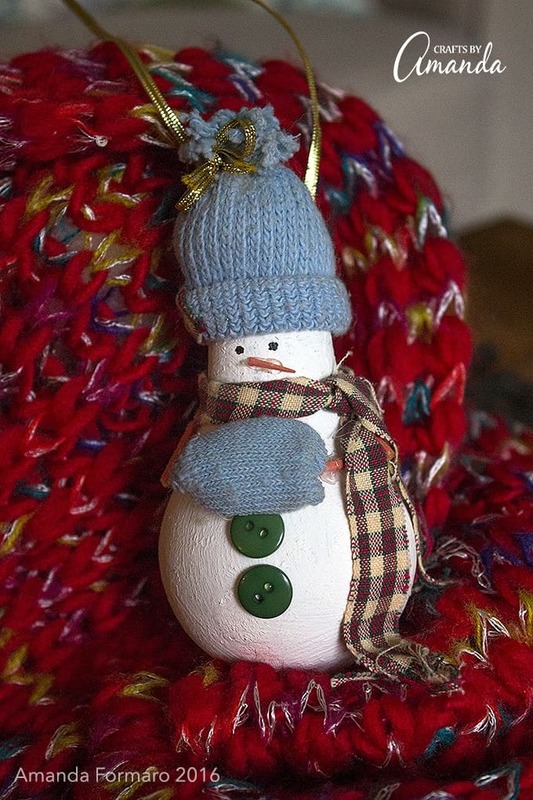 If that makes you happy too, try this light bulb snowman for yourself or to give as a gift. While bulb is drying, cut off the ribbing from the child’s sock. Roll up a brim at one end and tie off the other end with gold ribbon or cord, tie in a bow. Leave about half an inch of sock above ribbon for the fluffy top, fringe ends. Add a bit of Fiberfil to the inside of the hat. Cut a tiny square of fabric and glue to the front brim of the hat. From the remaining material on the sock, cut a rectangle, about 2 inches wide and 1 1/2 inches long. Place a small amount of Fiberfil in the center, roll up jelly roll style and glue together. Glue ends closed. Take one of the toothpicks and carefully cut/break in half. Insert pointed side of each toothpick into the muff on either side. Once light bulb is dry, glue the muff to the belly of the bulb, below the neck and above the fattest part of the bulb. Glue the toothpicks to the bulb. Using another toothpick, cut into fourths. Using the sections that do not have pointed ends, glue to the toothpick arms that are already in place on the bulb. This will create the elbow to the shoulder. Glue to the elbow and to the bulb (see photo for guide). Fit hat snugly over socket of light bulb and glue in place. To create the hanger, tie a long piece of ribbon into a loop. 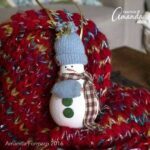 With the hanging ends, tie around the hat underneath the brim (roll it down out of your way). Loop tie should be positioned at the back of the hat. Tie ribbon tight and snip off extra ends. Roll brim back up to cover ribbon. Fashion a scarf from scrap material and tie carefully around neck, glue in place. Fringe ends of scarf with scissors. Glue two buttons to belly area, tuck top button underneath muff halfway. With one of the remaining pointed toothpicks that you cut into fourths, glue on for nose. Carefully dot on eyes with black marker. Hang! Special note: You may not use all the toothpicks that the instructions call for. They are easily split when broken or cut, so I allowed for that with extras. Wipe bulb down with rubbing alcohol, this will help the paint adhere to the bulb. Let dry. Paint entire light bulb with white acrylic paint and let dry. Apply a second coat. If finish appears streaked, you can use a large paint brush or a sponge to blot on a "stucco" look. It is not necessary to paint the socket. Allow bulb to dry completely. While bulb is drying, cut off the ribbing from the child's sock. Roll up a brim at one end and tie off the other end with gold ribbon or cord, tie in a bow. Leave about half an inch of sock above ribbon for the fluffy top, fringe ends. Add a bit of Fiberfil to the inside of the hat. Cut a tiny square of fabric and glue to the front brim of the hat. 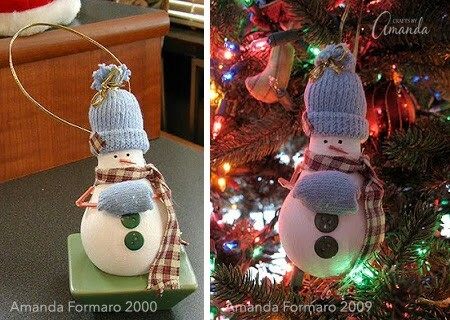 Love this idea of making a light bulb into a snowman, going to do some for Christmas! Hi Glenda. Are you saying you want to use the cup as is on a light bulb? or you want to shrink it like I do in my Spring Bonnet tutorial? I went on pintrest a saw everything…WoW… I sent it to my cousin who is a 3rd grade teacher. I’m sure she will find things to make with her class. Great ideas. Love the Turkey lightbulb and what you did with the acorns. Oh, and the bread tags, too cute. I just found you on Creative Income, I love Snowmen too! I would like to see the Angel & Penguin. I’m sure they are just as cute. Thanks for the pattern info. Have a wonderful Holiday Season. can use a pipe cleaner for arms ? This is the cutest light bulb ornament that I’ve ever seen! Hi there, I have one question that i have yet to have someone solve with regards to using light bulbs in a craft project. What makes this project safe?